On May 12th, 1996 we published the first crude pages of our website on the internet. Which means we could celebrate the 10 Year Anniverary in May 2006! A quick recap of the years 1996-2006. In 1996 our computer ran on Windows 3.11, we had access to the internet through a 14400 bps modem and we browsed the net with Netscape 1.2. The internet was dominated by the US, so we decided to have our website in English. That way the largest number of visitors could at least read what we had to say. From day one we wanted to show them our love for leather as can be seen by the first pictures we published. 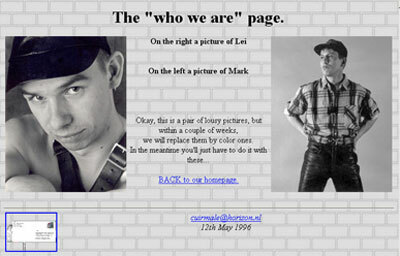 Early 1997 we introduced frames and a report on the Mr. Leather Holland elections with a lot of pictures. It wasn't easy to digitalise those pics in a time when we didn't have a digital camera yet, or a scanner, but we had our ways. The internet developed fast and so did our website. The 1997-1998 version was much more elaborate. We introduced some features that can still be seen today, like the "Leather Gear game" and the "Gay Leather Fetish History". That history was introduced because we were disappointed you couldn't find anything about the gay leather history on the internet in those days. It has been a huge succes from the start. Since 1998 we have had a number of 'make-overs' for our website. It became slightly less personal for privacy reasons in a changing world and some new features like a guestbook were introduced to make it more interactive. 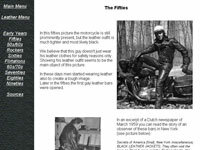 In 2002 it became a two part website when we divided it into a "Personal" and a "Gay Leather Fetish History" part. In 2006 we were aware that in a changing internet with numerous daily updated blogs and portals that allow everybody to have a profile with pictures and ways to chat, our website was perhaps becoming slightly old-fashioned. But we felt that our "Gay Leather Fetish History" was still unique and reason enough to keep the website up and running. From January 2007 we decided to downgrade the personal pages even more and put even more focus on the Gay Leather Fetish History for that reason.